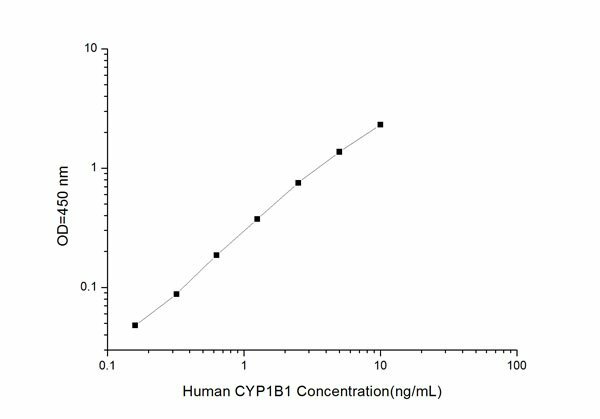 This assay has high sensitivity and excellent specificity for detection of Human CYP1B1. No significant cross-reactivity or interference between Human CYP1B1 and analogues was observed. Note: Limited by current skills and knowledge, it is impossible for us to complete the cross- reactivity detection between Human CYP1B1 and all the analogues, therefore, cross reaction may still exist. Small volumes of CYP1B1 elisa kit vial(s) may occasionally become entrapped in the seal of the product vial during shipment and storage. If necessary, briefly centrifuge the vial on a tabletop centrifuge to dislodge any liquid in the container`s cap. Certain products may require to ship with dry ice and additional dry ice fee may apply. MBS2514080 is a ready-to-use microwell, strip plate ELISA (enzyme-linked immunosorbent assay) Kit for analyzing the presence of the CYP1B1, ELISA Kit target analytes in biological samples. The concentration gradients of the kit standards or positive controls render a theoretical kit detection range in biological research samples containing CYP1B1. The ELISA analytical biochemical technique of the MBS2514080 kit is based on CYP1B1 antibody-CYP1B1 antigen interactions (immunosorbency) and an HRP colorimetric detection system to detect CYP1B1 antigen targets in samples. The ELISA Kit is designed to detect native, not recombinant, CYP1B1. Appropriate sample types may include undiluted body fluids and/or tissue homogenates, secretions. Quality control assays assessing reproducibility identified the intra-assay CV (%) and inter-assay CV(%). Principle of the Assay: This ELISA kit uses Sandwich-ELISA as the method. The micro ELISA plate provided in this kit has been pre-coated with an antibody specific to Human CYP1B1. Standards or samples are added to the appropriate micro ELISA plate wells and bound by the specific antibody. Then a biotinylated detection antibody specific for Human CYP1B1 and Avidin-Horseradish Peroxidase (HRP) conjugate is added to each micro plate well successively and incubated. Free components are washed away. The substrate solution is added to each well. Only those wells that contain Human CYP1B1, biotinylated detection antibody and Avidin-HRP conjugate will appear blue in color. The enzyme-substrate reaction is terminated by the addition of a sulphuric acid solution and the color turns yellow. The optical density (OD) is measured spectrophotometrically at a wavelength of 450 nm +/- 2 nm. The OD value is proportional to the concentration of Human CYP1B1. You can calculate the concentration of Human CYP1B1 in the samples by comparing the OD of the samples to the standard curve. NCBI/Uniprot data below describe general gene information for CYP1B1. It may not necessarily be applicable to this product. CYP1B1: Cytochromes P450 are a group of heme-thiolate monooxygenases. In liver microsomes, this enzyme is involved in an NADPH-dependent electron transport pathway. It oxidizes a variety of structurally unrelated compounds, including steroids, fatty acids, and xenobiotics. Defects in CYP1B1 are the cause of primary congenital glaucoma type 3A (GLC3A). GLC3A is an autosomal recessive form of primary congenital glaucoma (PCG). PCG is characterized by marked increase of intraocular pressure at birth or early childhood, large ocular globes (buphthalmos) and corneal edema. It results from developmental defects of the trabecular meshwork and anterior chamber angle of the eye that prevent adequate drainage of aqueous humor. Defects in CYP1B1 are a cause of primary open angle glaucoma (POAG). POAG is a complex and genetically heterogeneous ocular disorder characterized by a specific pattern of optic nerve and visual field defects. The angle of the anterior chamber of the eye is open, and usually the intraocular pressure is increased. The disease is asymptomatic until the late stages, by which time significant and irreversible optic nerve damage has already taken place. In some cases, POAG shows digenic inheritance involving mutations in CYP1B1 and MYOC genes. Defects in CYP1B1 are a cause of Peters anomaly (PAN). Peters anomaly is a congenital defect of the anterior chamber of the eye. Belongs to the cytochrome P450 family. 1. Homozygous carriers of the C-allele (*1/*1) at the CYP1B1 Leu432Val polymorphism show a higher response to environmental factors, such as carcinogenic Benzo(a)pyrene, than homozygous carriers of the G-allele *3/*3.